Think currency. Think relevancy. Think Critically. Think Critically, 2016 presents critical thinking as the optimal approach for solving real-world problems and making important decisions, boosting the relevance of course material to students’ lives. 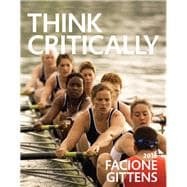 Authors Peter Facione and Carol Ann Gittens employ a simple, practical approach to deliver the core concepts of critical thinking in a way that students can easily understand. Incorporating contemporary material from a wide range of real-life situations, Think Critically’s engaging examples and exercises hammer home positive critical thinking habits of mind that students can use — in the classroom and beyond. Think Critically, 2016 is also available via REVEL™, an immersive learning experience designed for the way today's students read, think, and learn. Peter A. Facione, PhD, has dedicated himself to helping people build their critical thinking to become better problem solvers and decisions makers. He does this work not only to help individuals and groups achieve their own goals, but also for the sake of our freedom and democracy. Facione draws on experience as a teacher, consultant, business entrepreneur, university dean, grandfather, husband, musician, and sports enthusiast. Now he is taking his message about the importance of critical thinking directly to students through Think Critically. “I’ve paid very close attention to the way people make decisions since I was 13 years old,” says Facione. “Some people were good at solving problems and making decisions; others were not. I have always felt driven to figure out how to tell which were which.” He says that this led him as an undergraduate and later as a professor to study psychology, philosophy, logic, statistics, and information systems as he searched for how our beliefs, values, thinking skills, and habits of mind connect with the decisions we make, particularly in contexts of risk and uncertainty. Facione spearheaded the international study to define critical thinking, sponsored by the American Philosophical Association. His research formed the basis for numerous government policy studies about critical thinking in the workplace, including research sponsored by the U.S. Department of Education. Published by Insight Assessment, his tools for assessing reasoning are used around the world in educational, business, legal, military, and health sciences. Today, Peter operates his own business, Measured Reasons. He is senior level consultant, speaker, writer, and workshop presenter. His work focuses on strategic planning and leadership decision making, in addition to teaching and assessing critical thinking. With his wife, who is also his closest research colleague and co-author of many books and assessment tools, he now lives in sunny Los Angeles, which he says, “suits [him] just fine.” You can reach him at pfacione@measuredreasons.com. Carol Ann Gittens, PhD, is an Associate Dean in the College of Arts & Sciences at Santa Clara University (SCU). She is an associate professor with tenure in the Liberal Studies Program and directs SCU’s undergraduate pre-teaching advising program and the interdisciplinary minor in urban education designed for students interested in pursuing careers in PreK-12 education. Gittens was the founding Director of Santa Clara University’s Office of Assessment from 2007 to 2012. As assessment director, she performed key activities related to institutional re-accreditation, educated academic and cocurricular programs in the assessment of student learning, and designed and oversaw an innovative multiyear, rubric-based assessment plan for a new core curriculum. She is an educational assessment mentor and accreditation evaluator for the Western Association of Schools and Colleges (WASC) as well as Board of Institutional Reviewers member of the California Commission on Teacher Credentialing (CTC), and a senior research associate with Insight Assessment, LLC. Gittens’ consulting activities include working with college faculty, staff and administrators, PreK-12 educators, as well as business executives, managers, and employees. Dr. Gittens’ areas of expertise include assessment of institutional effectiveness and student learning outcomes, institutional and professional accreditation planning, translating strategic vision into measureable objectives, designing sustainable assessment systems at all levels of the institution, critical thinking pedagogy and assessment, integrating critical thinking and information literacy across the curriculum and in cocurricular programs, as well as statistics and assessment design for individuals and institutions. Gittens earned her PhD in Social and Personality Psychology from the University of California at Riverside. She received her BA in Psychology and Women’s Studies from the University of California at Davis. Prior to her appointment at Santa Clara University she taught at California State University, San Bernardino and at Mills College in Oakland, California. Gittens and her husband live in California’s Silicon Valley with their teenaged daughter and son, and their 4-year-old daughter. She is an active parent volunteer in her children’s school, and is involved with K-12 schools in the local community, offering teacher training workshops on nurturing and assessing students’ critical thinking.